Funnel Science is a marketing support agency and SaaS software that works with brands & and their agencies to develop and hone their online sales funnels. We are a specialized team of marketing and sales funnel experts with consultants certified in Google AdWords® PPC Marketing, Google® Analytics, Google® Display Marketing, Bing® PPC Advertising, Facebook Paid Ads and Youtube® video ads. Funnel Science® was coined in 2009 by Alex Fender, a Google Certified Marketing consultant who developed a process using science and software to control, test, and measure purchasing behavior to predict the performance of digital marketing. The software is able to directly measure the impact on conversion rate, sales close ratio’s, revenue, profitability and the impact of time to purchase. Through data mining and pattern recognition techniques, executed with machine learning, Funnel Science® emerged as a leading predictive analytics marketing and sales tool. It took more than 2 years to develop Funnel Science technology, software and statistical modeling and in the Spring of 2011, research & development was complete and the results had been verified and validated. In 2012, Alex was 1 of only a handful of Google Adwords Experts personally invited by Google to enter into the 2012 Google Engage All-Stars Competition. Alex and his team outperformed his colleagues and were announced prize winners on June 21, 2012. In July of 2013, Funnel Science won the 2013 Google Engage All Stars competition and was flown to Google Head Quarters to meet with executives from Google at the All Stars Summit. The Funnel Science team won the All-Stars competition from 2012 to 2015. 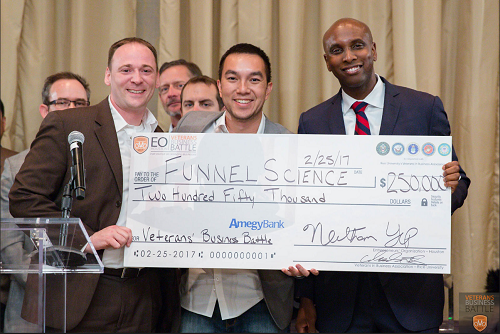 In 2017 Alex entered into the Veteran Business Battle held at Rice University, a business plan competition for Veteran owned companies. Funnel Science® won first place in the business competition. Now, Funnel Science® is comprised of a multidisciplinary team of Google Certified Consultants, Graphic Artists, PPC Analyst, Developers and Conversion Optimization Experts. Our company has supported to thousands of leading brands, full service & creative marketing agencies, search engine optimization (SEO) companies, and website developers to aid in conversion optimization, Google AdWords® ppc management, Google® Analytics support, and sales funnel consulting. We are a Marketing & Sales Analytics company specializing in digital marketing, aka. also known as an A/b Testing Agency or Conversion Rate Optimization Agency.